Do Digital Catalogs Drive Conversions? But printed catalogs are prohibitively expensive to produce and distribute. They are often the largest expenditure that a merchant makes. This has effectively eliminated catalogs as a marketing tool for many merchants. The popularity of tablet computers has changed the way that customers are using the Internet. Like a traditional catalog, tablets are used at the breakfast table, in front of the television, and in bed, making it a compelling device for digital catalogs. Digital catalog apps have quietly been creating a revolution in the catalog business. Rather than printing a catalog, merchants can join a group catalog app — which includes products from many different merchants — to get access to a massive stream of new shopping traffic for a fraction of the cost. This brings an important new stream of high quality traffic within the reach of all merchants. These apps present tablet users with easy access to all their favorite catalogs in one place: and on their tablets. They can browse, Pin, Like, compare items from multiple catalogs, and click through to place an order on the ecommerce site. What’s more, it’s really simple for merchants to get involved. Google Catalogs costs nothing for a merchant. Others like Catalog Spree charge you only for the traffic that clicks through to your site. It’s a great idea. But how well do they actually work in driving conversions? I spoke with Donna Bouchard, vice president of Hamilton Jewelers — a 100-year-old Princeton, N.J.-based jeweler with five retail locations and an ecommerce store — about the company’s experience as an earlier adopter of online catalogs. Ecommerce has traditionally only accounted for 4- 5 percent of the company’s sales. But it plays an important role in getting customers to the point of purchase, often in the store. Hamilton Jewelers’ tablet app on Catalog Spree. When the digital catalog first went live, Hamilton noticed an immediate 30 – 40 percent jump in traffic, which has sustained, and a 10-20 percent growth in traffic each month since launch. Sixty-eight percent of traffic from the catalog is new traffic. In theory, measuring conversions shouldn’t be a problem. It should be as simple as adding tracking code to the URL, so that it shows up in your web analytics program. However, the metrics you get from the tablet (opens, page views and clicks) are separate from your web analytics. This is an area that Google reportedly plans to address on in the future. “A lot of merchants view clicks rather than conversions, because the tablet is not a chosen device for conversion. It’s painful to have to enter in all of your order information on a tablet, so many customers go back later when they’re at their desktop. We’ve seen a lot of people browse, then, just like with a print catalog, do their shopping later. It’s often not a clean click-and-convert, because when you’re on a tablet, you’re in a browse mode,” adds Holtz. Shawn Behnam, president of CirqueJewels.com — a U.S.-based, ecommerce-only retailer — has found that all his visitor metrics from catalog traffic are up. “The average visitor that has clicked through from our digital catalog spends twice as long (on our ecommerce site), close to 10 minutes,” he said. “The conversion rate is double our normal conversion rate, and the average order value is $200 while our normal average order is $150.” CirqueJewels.com uses Catalog Spree for its digital catalog. 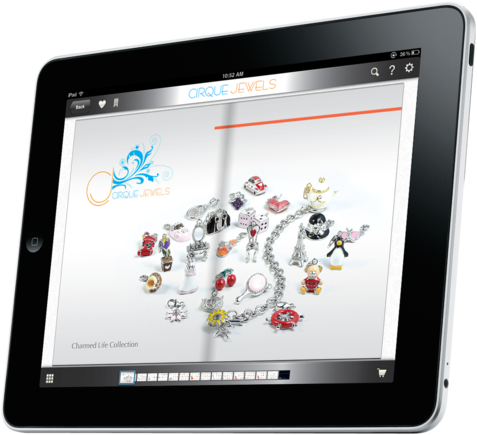 CirqueJewels.com’s digital tablet-based catalog, also on Catalog Spree. Digital tablets clearly help drive online sales for large and small brands, even if they’ve never had a printed catalog. Donna Bouchard with Hamilton Jewelers refers to the “halo effect” for small brands, in which a smaller merchant can be more credible by being featured alongside large brands. For minimal effort, merchants can have a presence on tablets. 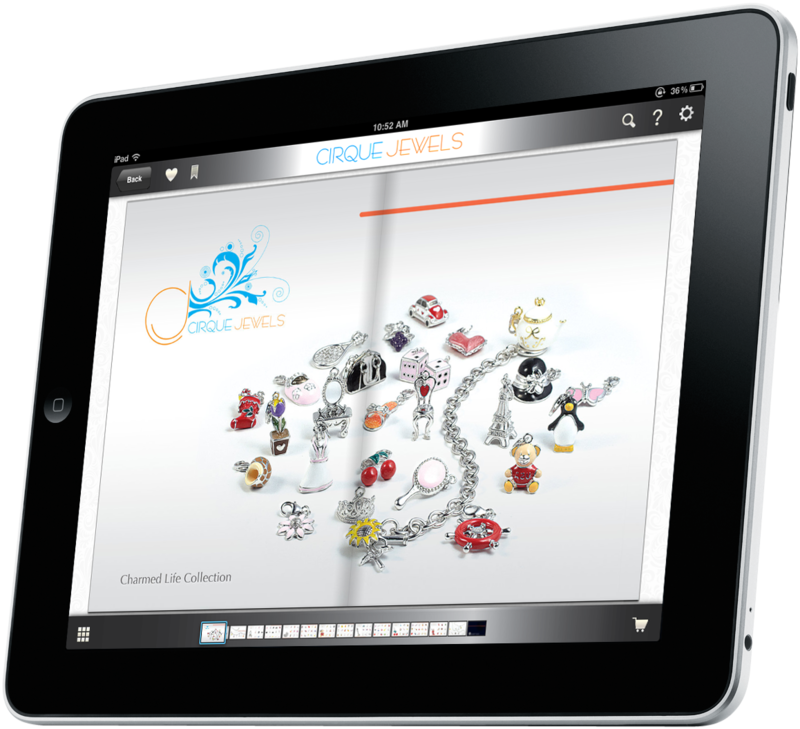 “It would have been prohibitive for a small company like us to build a tablet app like this,” explained CirqueJewels.com’s Behnam. Stay current. Submit new catalogs as soon as they are available. Refresh frequently. Catalogs that feature products that are long out of stock will frustrate customers. Use compelling photos. Provide high-quality imagery using alternate product views and high-resolution product images. If your products come in different colors, try to display all of them. Keep items in stock. Monitor stock levels for items that are featured prominently in the catalog. hey will sell out faster than items and colors that are not featured. Use rich media. Include engaging, highly relevant rich-media content —like how-to videos — when applicable. Your catalog is more likely to be promoted by the app if you have good content. Use email remarketing. Integrate email remarketing to nudge visitors that click through but don’t buy.